Weddings....Recently I had the privilege of shooting another wedding. I absolutely love shooting happy people. Whether moms to be, newborns, children, seniors or newlyweds. 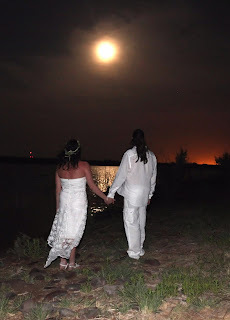 This was a moonlight wedding that was supposed to be a wedding at sunset. But as we all know, the West Texas sunsets do not wait for anyone and was gone in the blink of an eye. This wedding broke my heart. One of those that you have great expectations for and then the bottom falls out. You know...we've all had them. Wind blowing 100 mph, sun setting too fast, family members missing and then....I have to smile. My tripod with my wonderful Canon Mark ii camera and Canon 100-400mm lens, along with my 580 ex flash goes crashing to the ground from my heavy duty tripod. I smile and pretend it's all ok as $5,000 worth of equipment hits a rock and lands into sand. Ever have those times when you could just close your eyes and make it all be GOOD?